Comments Off on Paul’s Plant Pick: Imagine! Blossoms on December 14th! As always, there are a number of items I could highlight in the garden this week. Choices and decisions! While shooting the winter pruning video with my very creative co-horts Stefan and Jenny, (Check out my Winter Pruning Video) I pointed out that the Knautia macedonica (pronounced naughtier) was STILL in flower in the Garden Entry Walk. As Stefan exclaimed “…and the winner is…” It is so incredible that there are still a few of the unique, crimson red, pincushion-type blooms on this very long-blooming perennial, which started flowering at the end of May! Much loved by our resident honey bees, Knautia never produces masses of flowers at one time. 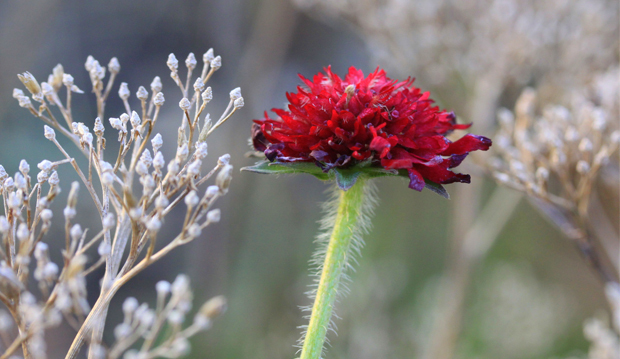 Deadheading (removing of the fading flowers) will encourage additional flower production on many perennials, but is not absolutely necessary with Knautia. I recommend leaving some of the fading blossoms alone so the plant can gently self-seed in the garden. Some of you may have been fortunate to pick up one of the few variegated Knautia (K. macedonica ‘Thunder and Lightning’) at our annual plant sale this past spring. What a fantastic plant, with vivid blooms above beautifully variegated foliage. I grow this plant in my home garden and love it. We are currently sourcing other wonderful plants for the 2013 TBG Plant Sale (May 9through 12, 2013) Remember, members and friends get to shop a day earlier on May 8, so mark your calendars. Speaking of dates, be sure not to miss the Ontario Rock Garden and Hardy Plant Society FIFTH Annual Super Plant Sale on Sunday, May 5. I always seem to go home with a few treasures even though I just “stop in to have a look.” The power of temptation! Consider a walk through the garden over the holidays to take in the textures, forms, shapes and seedheads. I will lead a winter tour of the garden lead on Saturday, February 23, 2013 as part of our annual horticultural open house, Get the Jump on Spring.